This article is about the classical concept. For the software company, see Oracle Corporation. For other uses, see Oracle (disambiguation). An oracle is a person or agency considered to provide wise and insightful counsel or prophetic predictions or precognition of the future, inspired by the gods. As such it is a form of divination. The word oracle comes from the Latin verb ōrāre, "to speak" and properly refers to the priest or priestess uttering the prediction. In extended use, oracle may also refer to the site of the oracle, and to the oracular utterances themselves, called khrēsmē (χρησμοί) in Greek. Oracles were thought to be portals through which the gods spoke directly to people. In this sense they were different from seers (manteis, μάντεις) who interpreted signs sent by the gods through bird signs, animal entrails, and other various methods. The most important oracles of Greek antiquity were Pythia, priestess to Apollo at Delphi, and the oracle of Dione and Zeus at Dodona in Epirus. Other oracles of Apollo were located at Didyma and Mallus on the coast of Anatolia, at Corinth and Bassae in the Peloponnese, and at the islands of Delos and Aegina in the Aegean Sea. The Sibylline Oracles are a collection of oracular utterances written in Greek hexameters ascribed to the Sibyls, prophetesses who uttered divine revelations in frenzied states. Walter Burkert observes that "Frenzied women from whose lips the god speaks" are recorded in the Near East as in Mari in the second millennium BC and in Assyria in the first millennium BC. In Egypt the goddess Wadjet (eye of the moon) was depicted as a snake-headed woman or a woman with two snake-heads. Her oracle was in the renowned temple in Per-Wadjet (Greek name Buto). The oracle of Wadjet may have been the source for the oracular tradition which spread from Egypt to Greece. Evans linked Wadjet with the "Minoan Snake Goddess". At the oracle of Dodona she is called Diōnē (the feminine form of Diós, genitive of PDyaeus; or of dīos, "godly", literally "heavenly"), who represents the earth-fertile soil, probably the chief female goddess of the proto-Indo-European pantheon. Python, daughter (or son) of Gaia was the earth dragon of Delphi represented as a serpent and became the chthonic deity, enemy of Apollo, who slew her and possessed the oracle. Danger will threat from a wooden boat, and a herald in scarlet. —  The Pythoness, in The Histories, Herodotus. The Pythia was the mouthpiece of the oracles of the god Apollo, and was also known as the Oracle of Delphi. The Pythia was not conceived to be infallible and in fact, according to Sourvinou-Inwood in What is Polis Religion?, the ancient Greeks were aware of this and concluded the unknowability of the divine. In this way, the revelations of the Oracles were not seen as objective truth (as they consulted many) [see: Hyp. 4. 14-15]. The Pythia gave prophecies only on the seventh day of each month, seven being the number most associated with Apollo, during the nine warmer months of the year; thus, Delphi was the major source of divination for the ancient Greeks. Many wealthy individuals bypassed the hordes of people attempting a consultation by making additional animal sacrifices to please the oracle lest their request go unanswered. As a result, seers were the main source of everyday divination. The temple was changed to a centre for the worship of Apollo during the classical period of Greece and priests were added to the temple organization—although the tradition regarding prophecy remained unchanged—and the priestesses continued to provide the services of the oracle exclusively. It is from this institution that the English word oracle is derived. The Delphic Oracle exerted considerable influence throughout Hellenic culture. Distinctively, this female was essentially the highest authority both civilly and religiously in male-dominated ancient Greece. She responded to the questions of citizens, foreigners, kings, and philosophers on issues of political impact, war, duty, crime, family, laws—even personal issues. The semi-Hellenic countries around the Greek world, such as Lydia, Caria, and even Egypt also respected her and came to Delphi as supplicants. Croesus, king of Lydia beginning in 560 B.C., tested the oracles of the world to discover which gave the most accurate prophecies. He sent out emissaries to seven sites who were all to ask the oracles on the same day what the king was doing at that very moment. Croesus proclaimed the oracle at Delphi to be the most accurate, who correctly reported that the king was making a lamb-and-tortoise stew, and so he graced her with a magnitude of precious gifts. He then consulted Delphi before attacking Persia, and according to Herodotus was advised: "If you cross the river, a great empire will be destroyed". Believing the response favourable, Croesus attacked, but it was his own empire that ultimately was destroyed by the Persians. She allegedly also proclaimed that there was no man wiser than Socrates, to which Socrates said that, if so, this was because he alone was aware of his own ignorance. After this confrontation, Socrates dedicated his life to a search for knowledge that was one of the founding events of western philosophy. He claimed that she was "an essential guide to personal and state development." This oracle's last recorded response was given in 362 AD, to Julian the Apostate. The oracle's powers were highly sought after and never doubted. Any inconsistencies between prophecies and events were dismissed as failure to correctly interpret the responses, not an error of the oracle. Very often prophecies were worded ambiguously, so as to cover all contingencies – especially so ex post facto. One famous such response to a query about participation in a military campaign was "You will go you will return never in war will you perish". This gives the recipient liberty to place a comma before or after the word "never", thus covering both possible outcomes. Another was the response to the Athenians when the vast army of king Xerxes I was approaching Athens with the intent of razing the city to the ground. "Only the wooden palisades may save you", answered the oracle, probably aware that there was sentiment for sailing to the safety of southern Italy and re-establishing Athens there. Some thought that it was a recommendation to fortify the Acropolis with a wooden fence and make a stand there. Others, Themistocles among them, said the oracle was clearly for fighting at sea, the metaphor intended to mean war ships. Others still insisted that their case was so hopeless that they should board every ship available and flee to Italy, where they would be safe beyond any doubt. In the event, variations of all three interpretations were attempted: some barricaded the Acropolis, the civilian population was evacuated over sea to nearby Salamis Island and to Troizen, and the war fleet fought victoriously at Salamis Bay. Should utter destruction have happened, it could always be claimed that the oracle had called for fleeing to Italy after all. Dodona was another oracle devoted to the Mother Goddess identified at other sites with Rhea or Gaia, but here called Dione. The shrine of Dodona was the oldest Hellenic oracle, according to the fifth-century historian Herodotus and in fact dates to pre-Hellenic times, perhaps as early as the second millennium BC when the tradition probably spread from Egypt. Zeus displaced the Mother goddess and assimilated her as Aphrodite. It became the second most important oracle in ancient Greece, which later was dedicated to Zeus and to Heracles during the classical period of Greece. At Dodona Zeus was worshipped as Zeus Naios or Naos (god of springs Naiads, from a spring which existed under the oak), and Zeus Bouleos (cancellor). Priestesses and priests interpreted the rustling of the oak leaves to determine the correct actions to be taken. The oracle was shared by Dione and Zeus. Trophonius was an oracle at Lebadea of Boeotia devoted to the chthonian Zeus Trophonius. Trophonius is derived from the Greek word "trepho" (nourish) and he was a Greek hero, or demon or god. Demeter-Europa was his nurse. Europa (in Greek: broad-eyes) was a Phoenician princess whom Zeus, having transformed himself into a white bull, abducted and carried to Creta, and is equated with Astarte as a moon goddess by ancient sources. Some scholars connect Astarte with the Minoan snake goddess, whose cult as Aphrodite spread from Creta to Greece. Near the Menestheus's port or Menesthei Portus (Greek: Μενεσθέως λιμήν), modern El Puerto de Santa María, Spain, was the Oracle of Menestheus (Greek: Μαντεῖον τοῦ Μενεσθέως), to whom, also, the inhabitants of Gades offered sacrifices. The term "oracle" is also applied in modern English to parallel institutions of divination in other cultures. Specifically, it is used in the context of Christianity for the concept of divine revelation, and in the context of Judaism for the Urim and Thummim breastplate, and in general any utterance considered prophetic. In Celtic polytheism, divination was performed by the priestly caste, either the druids or the vates. This is reflected in the role of "seers" in Dark Age Wales (dryw) and Ireland (fáith). 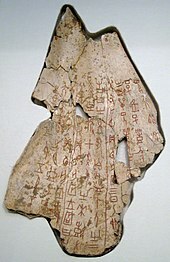 In China, oracle bones were used for divination in the late Shang dynasty, (c. 1600–1046 BC). Diviners applied heat to these bones, usually ox scapulae or tortoise plastrons, and interpreted the resulting cracks. A different divining method, using the stalks of the yarrow plant, was practiced in the subsequent Zhou dynasty (1046–256 BC). Around the late 9th century BC, the divination system was recorded in the I Ching, or "Book of Changes", a collection of linear signs used as oracles. In addition to its oracular power, the I Ching has had a major influence on the philosophy, literature and statecraft of China since the Zhou period. In Hawaii, oracles were found at certain heiau, Hawaiian temples. These oracles were found in towers covered in white kapa cloth made from plant fibres. In here, priests received the will of gods. These towers were called 'Anu'u. An example of this can be found at Ahu'ena heiau in Kona. In ancient India, the oracle was known as akashwani or Ashareera vani (a person without body or unseen) or asariri (Tamil), literally meaning "voice from the sky" and was related to the message of a god. Oracles played key roles in many of the major incidents of the epics Mahabharata and Ramayana. An example is that Kamsa (or Kansa), the evil uncle of Krishna, was informed by an oracle that the eighth son of his sister Devaki would kill him. However, there are no references in any Indian literature of the oracle being a specific person. The Igbo people of southeastern Nigeria in Africa have a long tradition of using oracles. In Igbo villages, oracles were usually female priestesses to a particular deity, usually dwelling in a cave or other secluded location away from urban areas, and, much as the oracles of ancient Greece, would deliver prophecies in an ecstatic state to visitors seeking advice. Two of their ancient oracles became especially famous during the pre-colonial period: the Agbala oracle at Awka and the Chukwu oracle at Arochukwu. Though the vast majority of Igbos today are Christian, many of them still use oracles. Among the related Yoruba peoples of the same country, the Babalawos (and their female counterparts, the Iyanifas) serve collectively as the principal aspects of the tribe's World-famous Ifa divination system. Due to this, they customarily officiate at a great many of its traditional and religious ceremonies. In Norse mythology, Odin took the severed head of the god Mimir to Asgard for consultation as an oracle. The Havamal and other sources relate the sacrifice of Odin for the oracular Runes whereby he lost an eye (external sight) and won wisdom (internal sight; insight). In the migration myth of the Mexitin, i.e., the early Aztecs, a mummy-bundle (perhaps an effigy) carried by four priests directed the trek away from the cave of origins by giving oracles. An oracle led to the foundation of Mexico-Tenochtitlan. The Yucatec Mayas knew oracle priests or chilanes, literally 'mouthpieces' of the deity. Their written repositories of traditional knowledge, the Books of Chilam Balam, were all ascribed to one famous oracle priest who correctly had predicted the coming of the Spaniards and its associated disasters. In Tibet, oracles have played, and continue to play, an important part in religion and government. The word "oracle" is used by Tibetans to refer to the spirit that enters those men and women who act as media between the natural and the spiritual realms. The media are, therefore, known as kuten, which literally means, "the physical basis". The Dalai Lama, who lives in exile in northern India, still consults an oracle known as the Nechung Oracle, which is considered the official state oracle of the government of Tibet. The Dalai Lama has according to centuries-old custom, consulted the Nechung Oracle during the new year festivities of Losar. Nechung and Gadhong are the primary oracles currently consulted; former oracles such as Karmashar and Darpoling are no longer active in exile. The Gadhong oracle has died leaving Nechung to be the only primary oracle. Another oracle the Dalai Lama consults is the Tenma Oracle, for which a young Tibetan woman by the name of Khandro La is the medium for the mountain goddesses Tseringma along with the other 11 goddesses. The Dalai Lama gives a complete description of the process of trance and spirit possession in his book Freedom in Exile. Dorje Shugden oracles were once consulted by the Dalai Lamas until the 14th Dalai Lama banned the practice, even though he consulted Dorje Shugden for advice to escape and was successful in it. Due to the ban, many of the abbots that were worshippers of Dorje Shugden have been forced to go against the Dalai Lama. ^ Flower, Michael Attyah. The Seer in Ancient Greece. Berkeley: University of California Press, 2008. ^ Herodotus, The Histories, ii 55, and vii 134. ^ Herodotus, The Histories, as translated in: Rawlinson, George; Rawlinson, Henry Creswicke; Wilkinson, John Gardner (1862). The History of Herodotus: A New English Version. II. London: John Murray. p. 376. Retrieved 3 August 2015. ^ Broad, W. J. (2007), p.63. Socrates also argued that the oracle's effectiveness was rooted in her ability to abandon herself completely to a higher power by way of insanity or "sacred madness." ^ Thomas, Carol G. (1988). Paths from Ancient Greece. Brill Publishers. p. 47. ^ Pausanias.Guide to Greece 9.39.2–5. ^ "LacusCurtius • Strabo's Geography — Book III Chapter 1". penelope.uchicago.edu. ^ "Dictionary of Greek and Roman Geography (1854), MENESTHEI PORTUS". www.perseus.tufts.edu. ^ OED s.v. "oracle n."
^ John Fischer. "'Anu'u (oracle tower) and Ki'i Akua (temple images) at 'Ahu'ena Heiau in Kailua-Kona on Hawaii's Big Island". About.com Travel. ^ Webster J.B. and Boahen A.A., The Revolutionary Years, West Africa since 1800, Longman, London, p. 107–108. Broad, William J. 2007. The Oracle: Ancient Delphi and the Science Behind Its Lost Secrets. New York: Penguin Press. Broad, William J. 2006. The Oracle: The Lost Secrets and Hidden Message of Ancient Delphi. New York: Penguin Press. Evans-Pritchard, E. 1976. Witchcraft, oracle, and magic among the Azande. Oxford: Clarendon Press. Smith, Frederick M. (2006). The Self Possessed: Deity and Spirit Possession in South Asian Literature. Columbia University Press, USA. ISBN 0-231-13748-6. Garoi Ashram, (2004–2015). The copper oracle of Sri Achyuta: answers as instantaneous inscription. Look up oracle in Wiktionary, the free dictionary. Wikimedia Commons has media related to Oracles. Chisholm, Hugh, ed. (1911). "Oracle" . Encyclopædia Britannica (11th ed.). Cambridge University Press.